Great for work or home. It may not be a fashion statement but it certainly gets the job done. Great whether you want to work your arms, legs, or get in a total body workout. 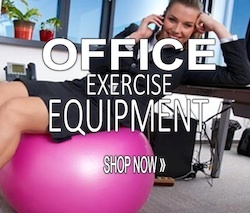 Roll a stability ball up to your desk to work with a different “attitude”. Can be used with or without a ball chair base and can be easily deflated. 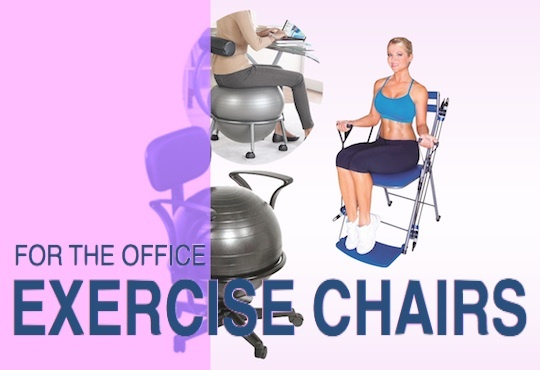 Similar to the Chair Gym except it is a chair attachment. 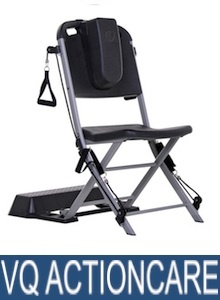 This is an industrial quality fitness product made for exercising your entire body with arm attachments and step. 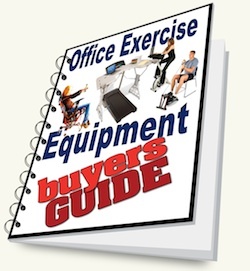 There are several different types and styles of chairs and exercise chair attachments that are manufactured specifically for the office or home environment so you can exercise productively in a small space. Exercise chairs can generally be grouped as resistance or stability. 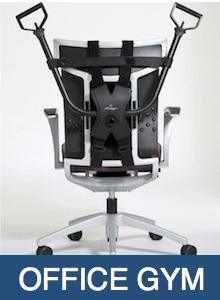 Another group of chairs are classified under “ergonomic” chairs and you can find more information here. 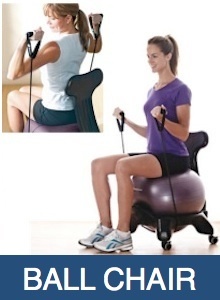 The balance (or stability) ball chair can be used quite comfortably with or without a ball chair base. Which ever way you choose to use it, make sure you set it up properly for comfort and good posture. Ensure your knees aren’t above your hips. If this happens you either need to blow up the ball more or need a larger ball. 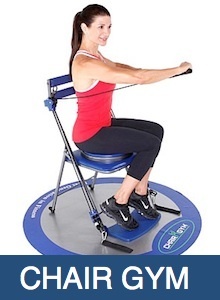 Some resistance chairs can provide a complete full body workout. This allows you to actively work your muscles. Of course you will probably have to stop working for a minute or two while you use them but a quick break every 15 minutes is better than no break at all. Movement is an important key to avoiding or reversing the damages of sitting disease.